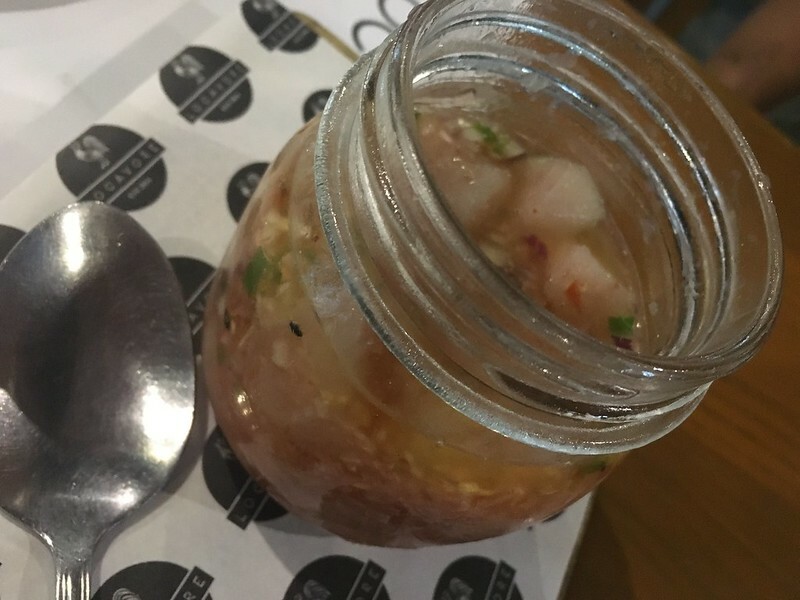 I’ve been hearing a lot about Locavore Kitchen & Drinks in Kapitolyo for the past few years since it opened but having moved offices from Ortigas to Quezon City, I just haven’t had too many opportunities to explore the Kapitolyo food scene anymore. Luckily, the fam was invited to a lunch treat by the in-laws at this resto which also served as our welcome break from hibernating at home due to the non-stop rain. 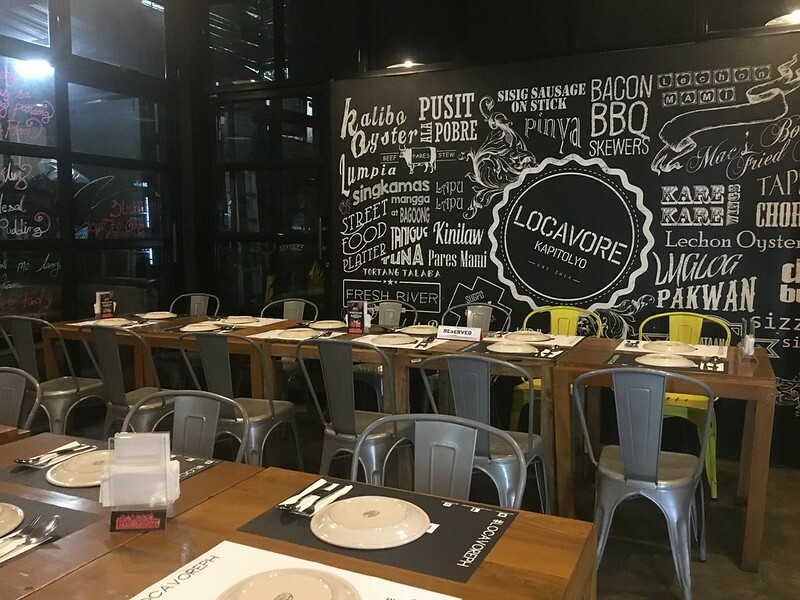 The recipient of the People’s Choice Award for Favorite Filipino Restaurant in 2017, Locavore champions local cuisine by revitalizing classic dishes with a new twist, no doubt influenced by the French cooking background of chef and co-owner Mikel Zaguirre. 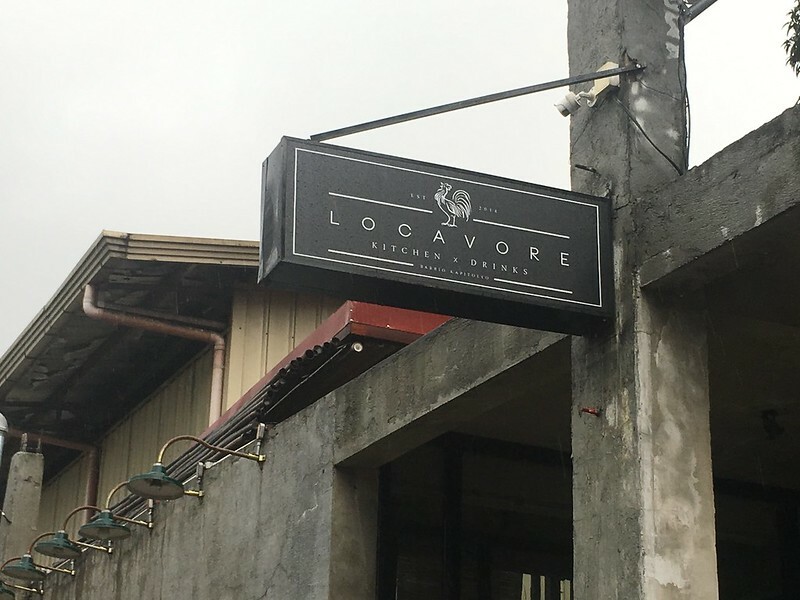 Its name Locavore sums up the resto’s culinary philosophy: a person who eats and appreciates food that’s locally grown, raised and produced. 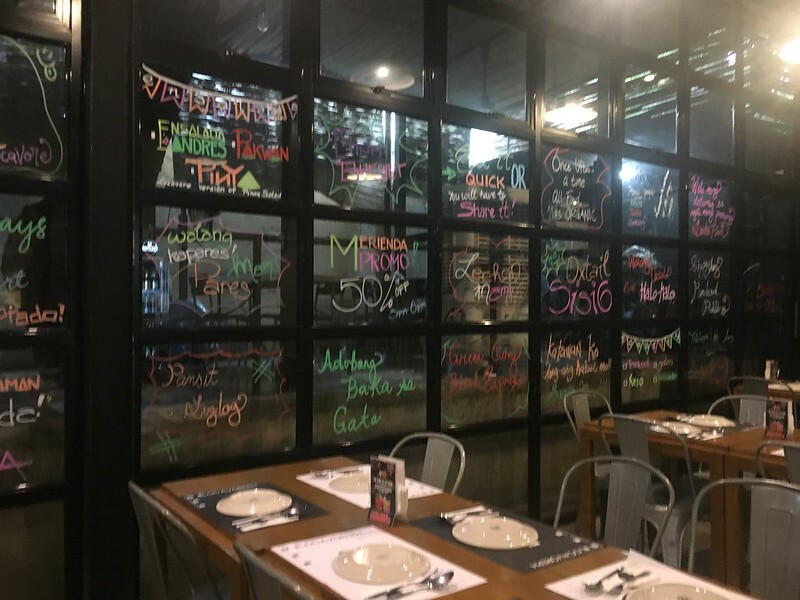 The place has a decidedly young and hip vibe to it, with a nice blend of wood and industrial-inspired interiors, designed by one the resto’s partners, Eric Matic. 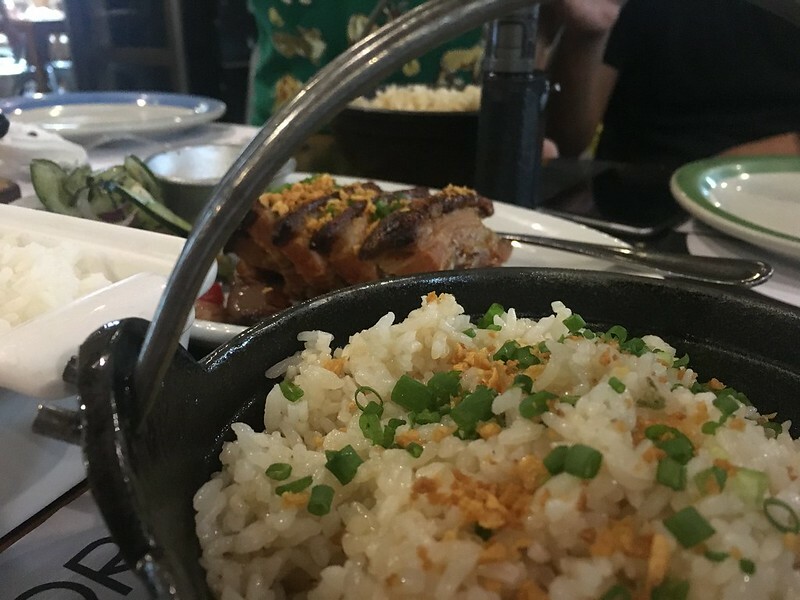 Once our party was complete, we feasted on main dishes that exemplify the concept of classic Filipino dishes given unique cosmopolitan twists. 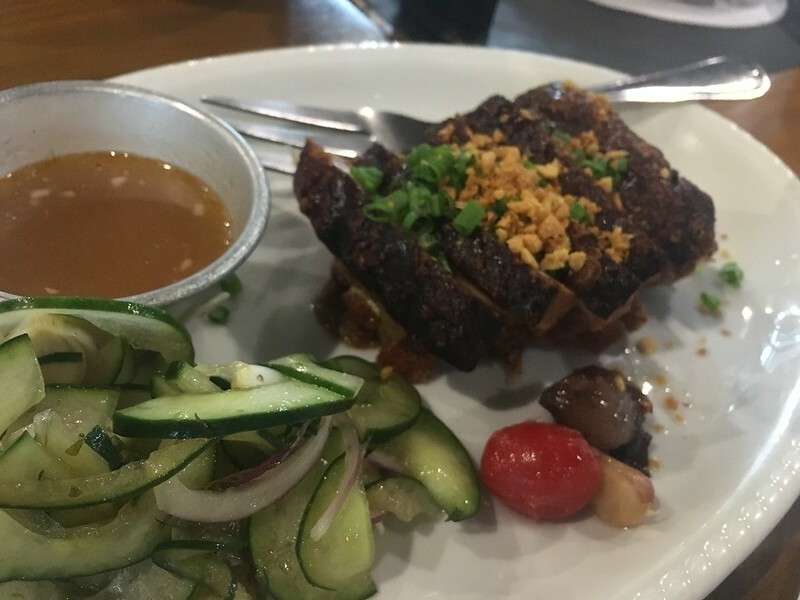 For example, the Boneless Lechon Belly (Php650) is a Cebu-style roasted pork belly that had a tender, mildly flavored meat with a crisp and crunchy skin. 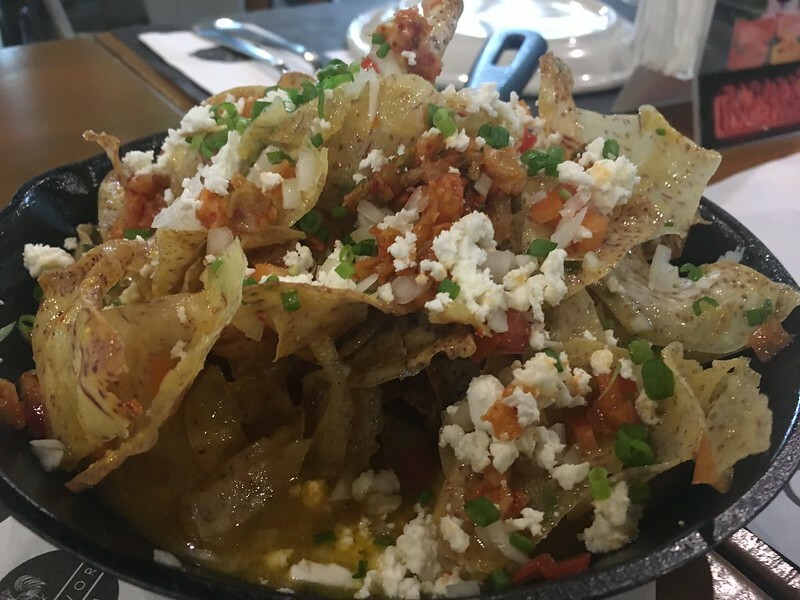 The Mac’s Boneless Fried Chicken (Php270), has a thick yet crisp batter enveloping the juicy chicken (since this dish was intended for the little boys in our group, the wait staff served it separately from the spicy glaze). 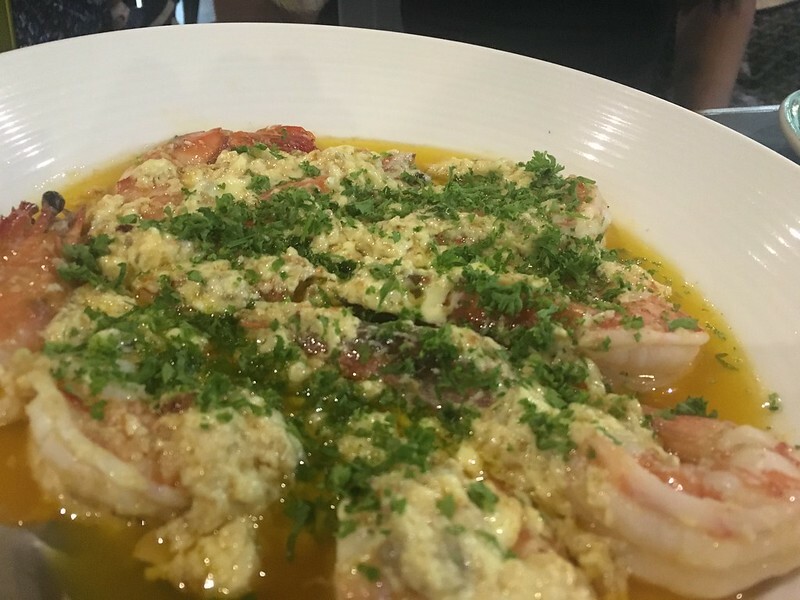 The Sugpo con Mayonesa (Php980) was a decadent dish of huge tiger prawns served with a rich sauce of aligue (crab fat), garlic, butter and Japanese mayo. 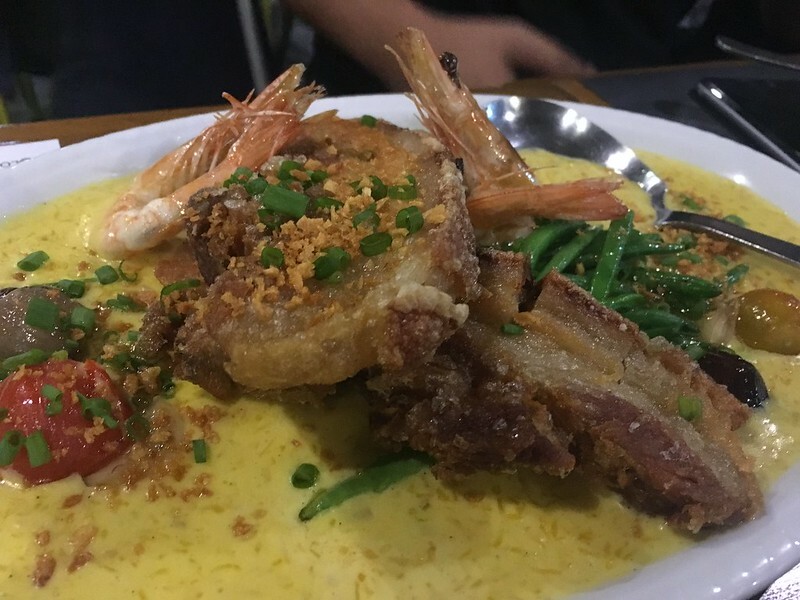 The Ginataang Kalabasa (Php420) features the Pinoy version of the pumpkin cooked in gata (coconut milk) and accompanied by French beans, shrimp and sizeable pork chop slices; it’s definitely an upgraded version of the vegetable dish that Pinoy moms would force us kids to eat for our health. Not being a fan of curry nor spicy food, I didn’t sample the Green Curry Bicol Express (Php480) anymore. 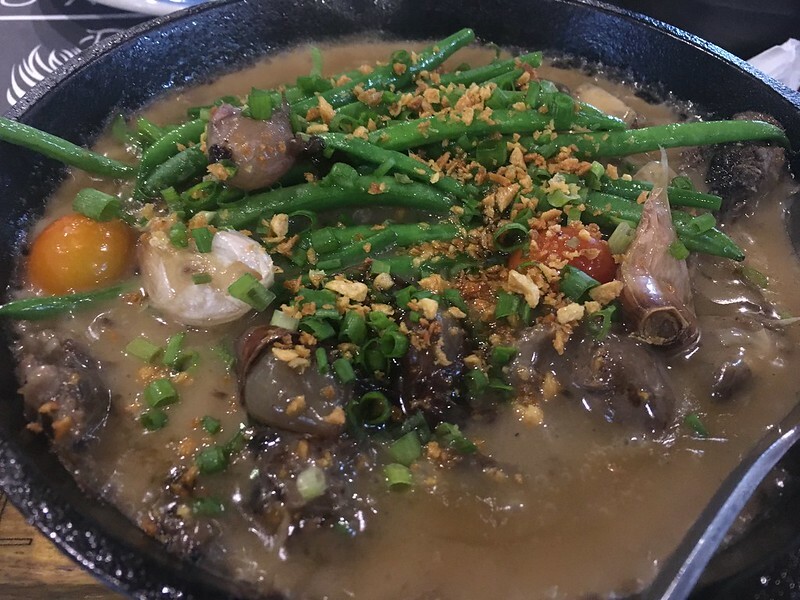 Of course, the piece de resistance of the meal is the Sizzling Sinigang (Php550), the classic Filipino soup dish transformed into a sizzling viand. 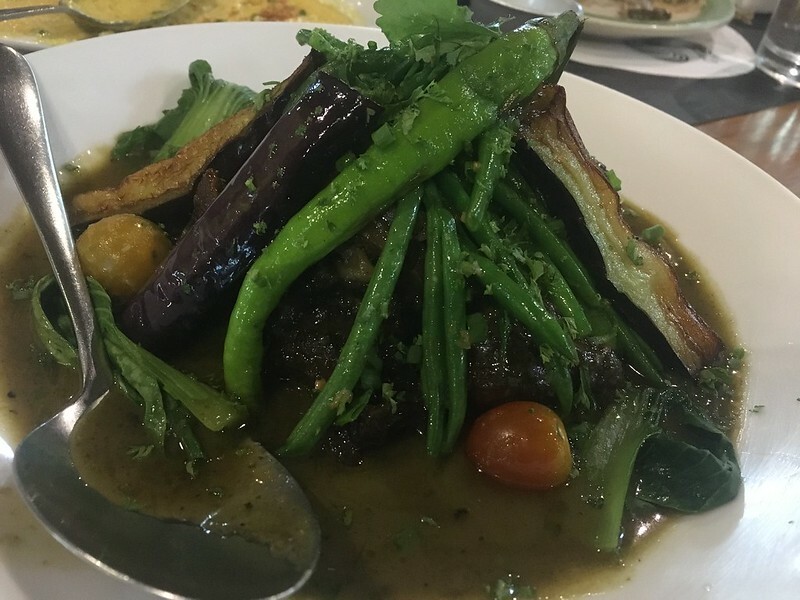 The sour sampaloc (tamarind) broth became a rich savory gravy that retained sinigang‘s characteristic sourness. Together with the sauteed French beans and garlic confit, it complemented the beef short-ribs slow-cooked to melt-in-your-mouth tenderness. All of these dishes were wonderfully set off by the various options of brown steamed rice, garlic white rice and steamed white rice that we ordered to accompany the viands. 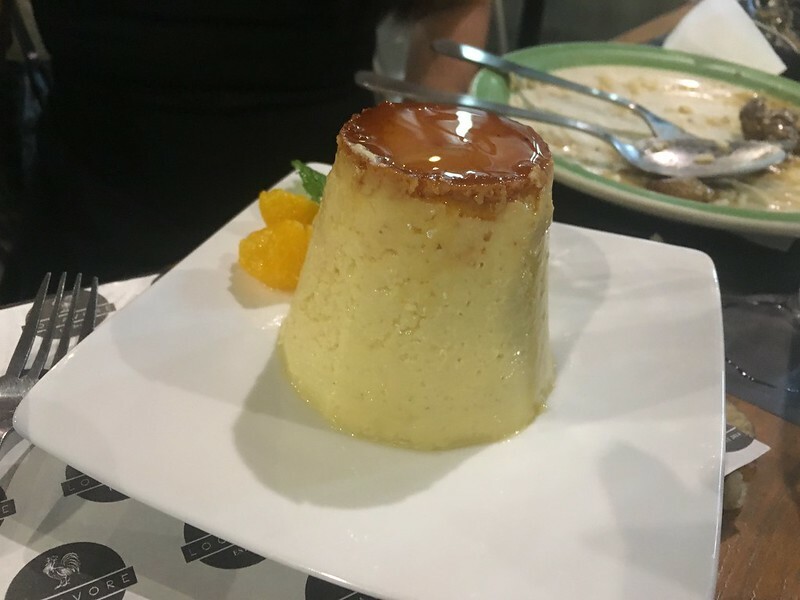 To cap the meal, we were treated to a tall tower of the house special Leche Flan (Php190), the Pinoy version of Creme Caramel, a rich and creamy custard served with a creamy caramel sauce on the side. We experienced a minor panic when my son got some hives due to allergy to the shrimp and tiger prawns (which was unfortunate because shrimp is among his favorite food). Good thing sister-in-law came to the rescue with some antihistamine she happened to have handy. 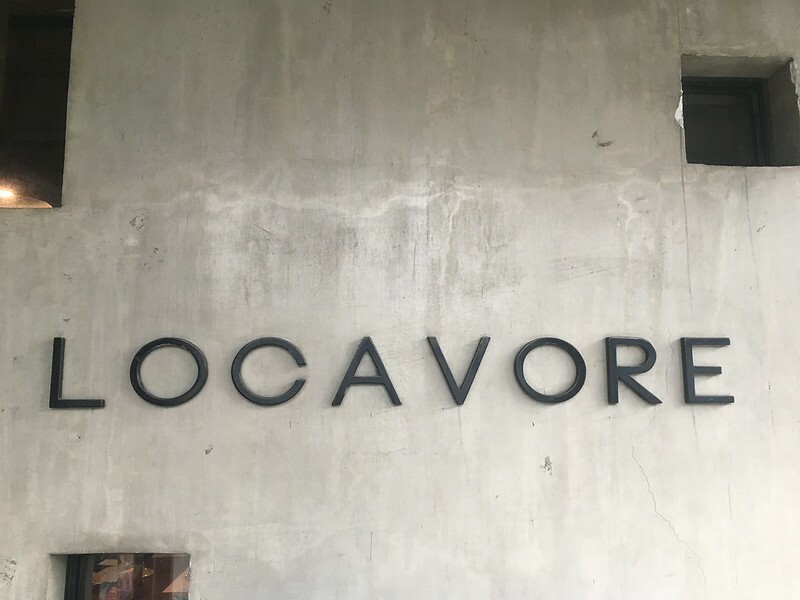 Despite that, I’m happy to say that Locavore more than lived up to my expectations when it comes to food flavor and presentation, and I look forward to exploring more of its offerings.